When unstable carbocations are formed under conditions typical for E1 reactions, hydride shift can occur. In acidic conditions, hydroxide as a poor leaving group is protonated by sulfuric acid to give a good leaving group. After the loss of the leaving group, unstable carbocation can be obtained. If electron-deficient carbon is in adjacent to a tertiary carbon. As the stability of carbocation increases with a number of alkyls group (primary < secondary < tertiary), so it will always rearrange when a more stable carbocation can be obtained. After hydride shift, the final product (alkene) is obtained using the Zaitsev rule. 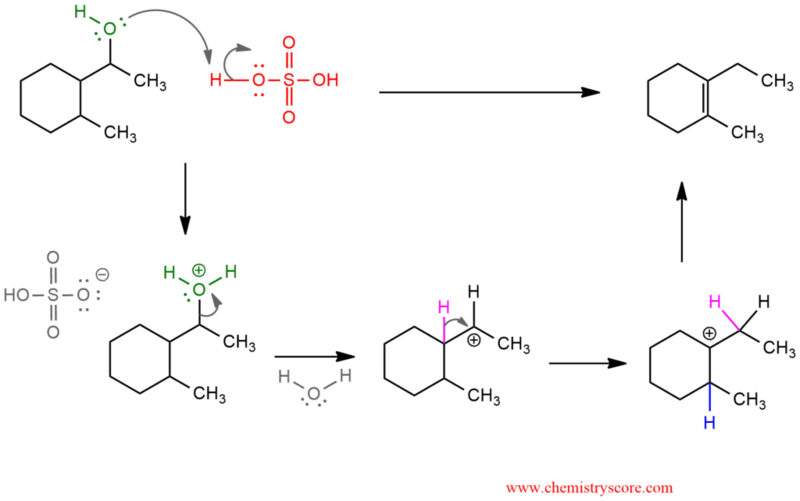 The major product is the more stable product – the one with a more substituted double bond.